When I was fourteen, my family and I traveled to Bangkok. I remember being left with the tour guide inside the car because my aunts and uncle will be watching a show that was strictly for adults only. Years after, I finally understood what that show was all about. And No, I didn't watch it during my most recent trip. Last September, I attended a meeting-conference in Bangkok. I was not so excited about this trip (except for the eating part!!!) because when they sent me the agenda, I knew there was no time for fun, and I was right. 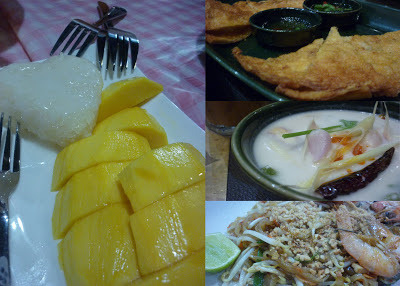 I dreamt of visiting the floating markets but as expected, we barely had time to have a look around. Thankfully, our hotel was located at the "heart" of Bangkok, where there were huge shopping malls all over the place that I had a hard time deciding which one to go first. 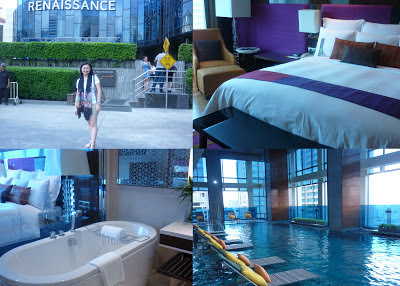 Renaissance Ratchaprasong is considered as a 5-star hotel and the room, amenities and services were superb. The bacon served in the breakfast buffet, however, did not meet my expectations. Five-star hotels should have those perfect hot crispy strips of bacon paired with a toast generously smeared with butter (I'm drooling as I'm typing this), but nah. They failed. Bacon and toast aside, I enjoyed the indoor swimming pool- no need to slather sunscreen. I squeezed in a 30-minute swim before the delegates gathered for dinner. The bath tub, was love at first sight. I miss my own pink tub at home, and on my last night in Bangkok, I poured several capfuls of bubble bath and sank my tired body and worries away. Some pictures I took during the trip. My fellow delegates and I tried our very best to wander around the city even if we're already exhausted from the days' talks and meetings.